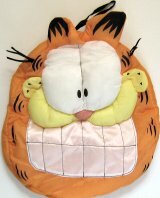 This round nylon Garfield pajama bag or pillow is 11 1/2" in diameter. Slit in the back to insert pajamas or a 10" round pillow. Loop for hanging. Previously owned but in excellent condition.